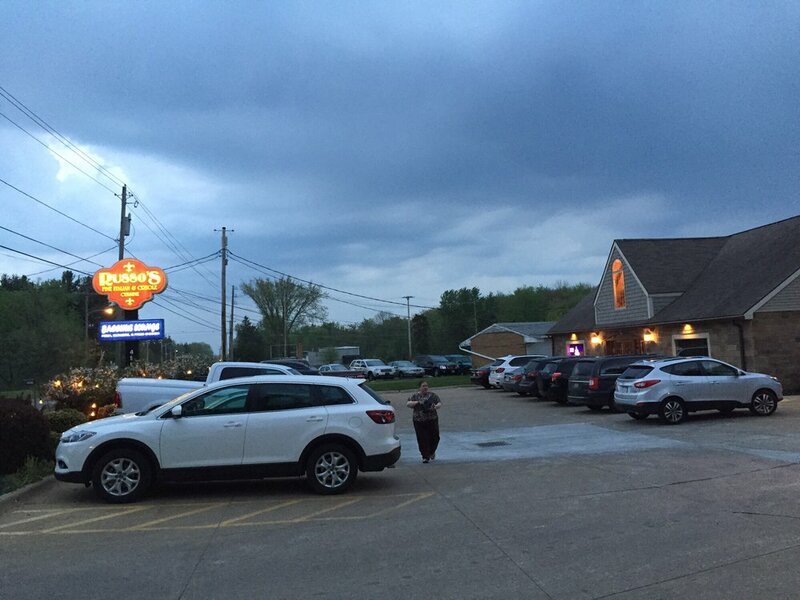 Russo’s Kitchen is a unique restaurant that straddles the border of Peninsula and Cuyahoga Falls on State Road (aka Akron-Cleveland Road) near the intersection with Seasons Road (Route 8 is close by). I learned about it from a fellow diner at a wine dinner at The Blue Door. He and his wife raved about the food and said they were there every Saturday. 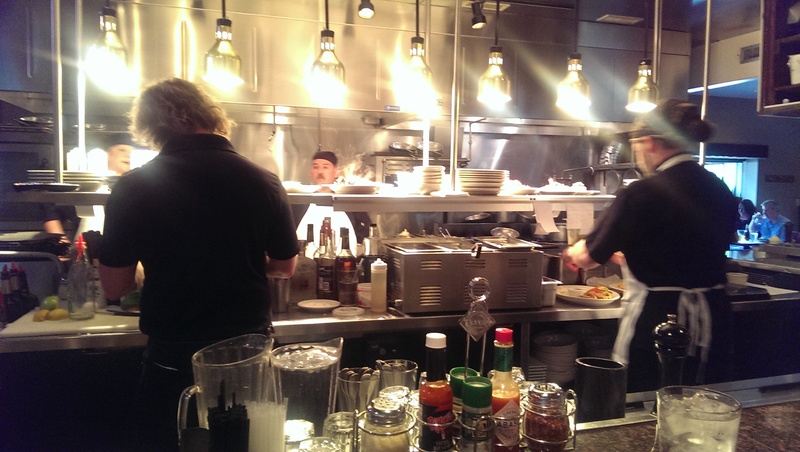 Sure enough, when I went there they were sitting at the bar around the open kitchen. We were sat at the counter and felt lucky. The place was packed so there really weren’t many available tables (it seats 97), but the counter overlooks the open kitchen. Russo’s has great food and friendly service, but it can be quite loud and hard to hear your dining companions when it is busy. The food theme is Italian/New Orleans fusion, so there is something for everyone. In the mood for seafood? 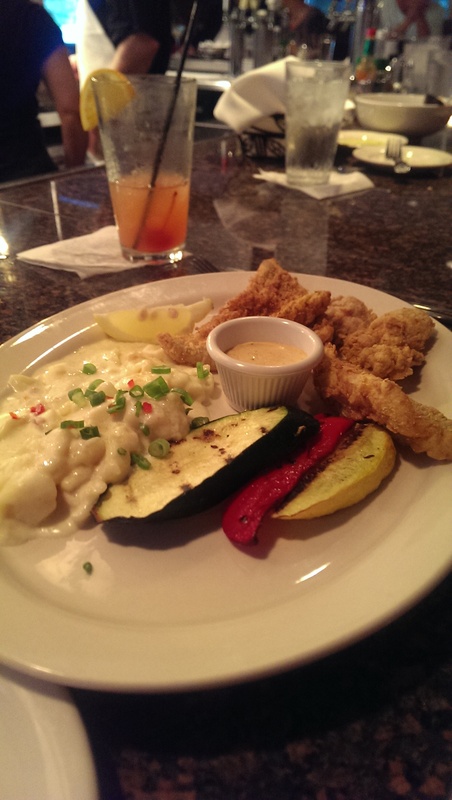 They have some amazing seafood choices like perch and oysters or grouper. Want pasta? How about cavatelli pomodoro with meatballs or meat or spinach and cheese ravioli? I love New Orleans. It is my favorite city in the U.S., and I’ve been there several times (and going again in September). I went to Russo’s with a friend who used to live in New Orleans, so naturally we focused on the Creole menu. 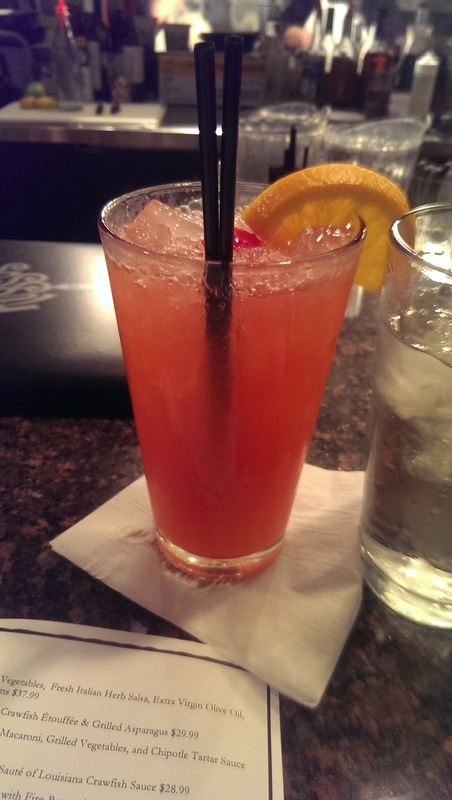 Of course I had to order a Hurricane. It is my absolute favorite drink, and this one was made without mixes and syrups. It was absolutely delicious and packed a wallop. It was possibly even better than the Hurricane at Pat O’Brien’s. The bread service is a homemade foccacia with olive oil dip. You could tell it was fresh and was very flavorful. It had a nice consistency to it and was toothsome on the outside and soft on the inside. My friend started off with the Gumbo Ya-Ya, which was very flavorful. She said it rivaled the gumbo down in NOLA. 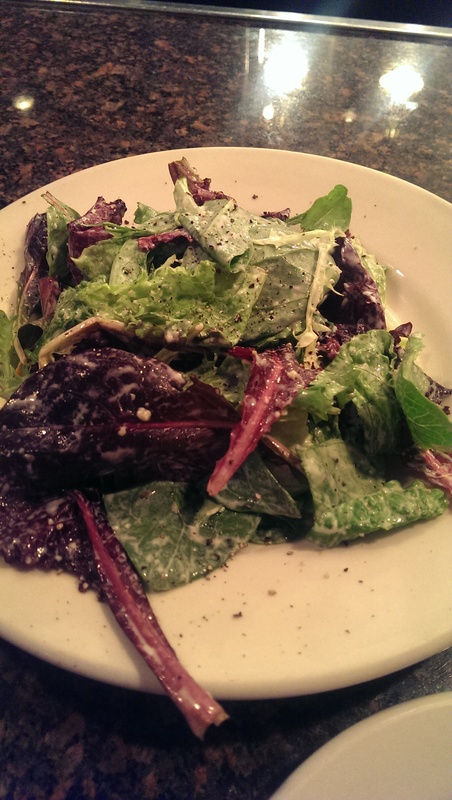 I had a house salad that featured fresh greens and a delicious White French dressing. The waitress offered fresh cracked black pepper, and I couldn’t resist. 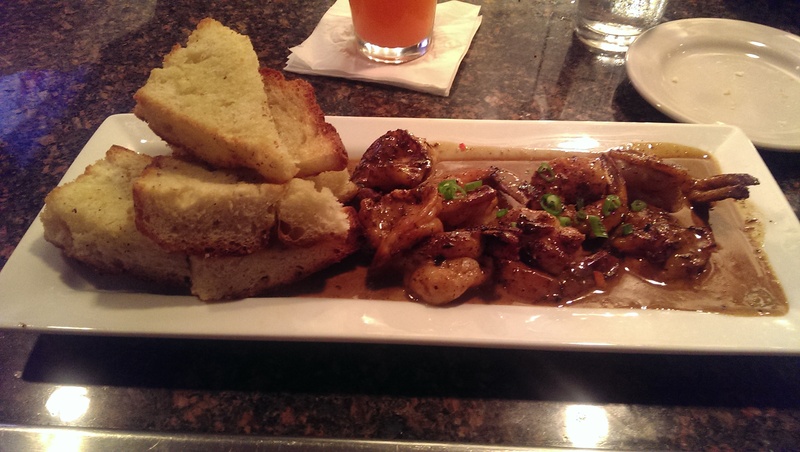 I decided to order the New Orleans BBQ Shrimp appetizer to save room for dessert. The appetizer was filling all on its own. The BBQ sauce was thick, silky, and absolutely delicious with a peppery bite and a hint of sweetness. It had a great flavor to it and was not too spicy. The shrimp were a decent size and perfectly cooked. I also really liked the grilled foccacia garlic bread they served with it to sop up the sauce. I would order it again in a heartbeat. In fact, my friend enjoyed the meal so much she went back a week or so later and ordered a variation on the same meal, this time lake perch and scallops with smokey baked 3-cheese macaroni, grilled seasonal vegetables, and chipotle tartar sauce. 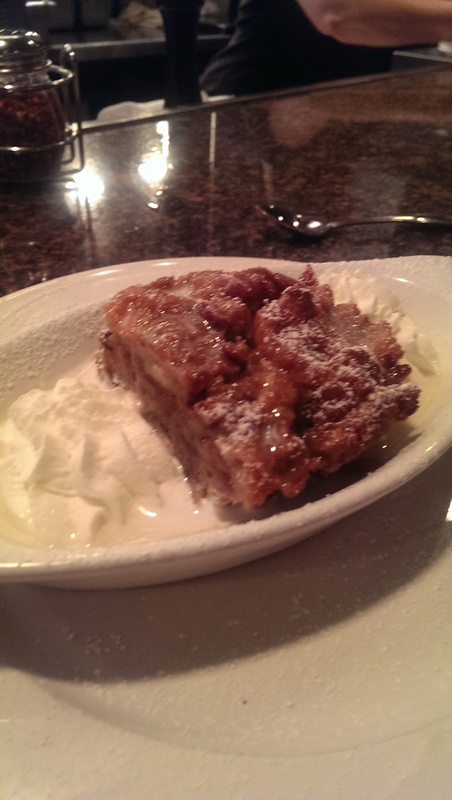 We splurged on dessert and ordered the bread pudding. It was deliciously creamy and luscious. I would order this one again too, but I also hear the peanut butter pie is delicious. In addition to the main restaurant there is also a more casual eatery with 60 seats called Bacchus in the back. It serves pizza, fried chicken and burgers as well as a few Creole and Italian choices. It is open for lunch and dinner, unlike the main restaurant which is only open for dinner service. Bacchus has a happy hour Tuesday through Friday from 3-6 PM. They have some drink specials (including some $5 cocktails) and select food choices ranging $3 for a slider to $6 for wings with hot pepper relish. My only word of advice is to not go here if you are in a hurry. Service is also very southern, and they give personal but slow service. It didn’t bother us because we had made a special trip there, but if you are stopping there on your way to Blossom plan to get there really early and plan for maybe 1 1/2-2 hours depending on how many courses you order.